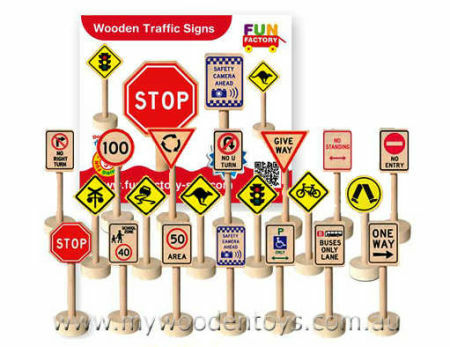 Wooden Toy Traffic Signs Aussie are 20 Australian Traffic signs to add to your train set, road set or just to use with your cars. It's great to have toy traffic signs that kids see in the world around them everyday. A wonderful way to teach sign recognition and road safety. Now you can set up all sorts of road adventures and set the speed limit as you race past the fridge. Signs have a good sturdy base, are easy to place and won't easily fall over. We like this because: "it's nice to see signs relevant to Australian kids"